Get rid of those pesky critters. Your pet is an easy target for parasites and small insects. Common parasites like ticks, fleas and heartworm-carrying mosquitos feed on your pets, potentially infecting them with many dangerous diseases. Discover how these tiny pests can cause big problems. These bloodsucking insects feed on mammals and lay eggs in their fur. 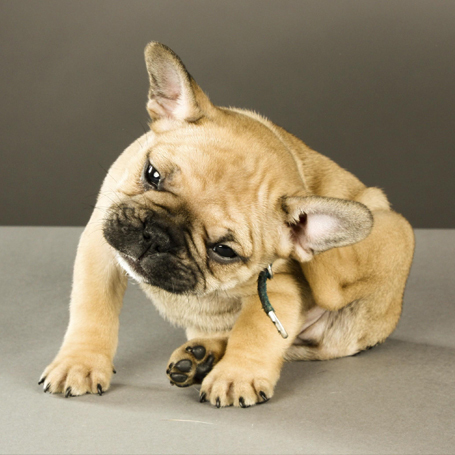 Fleas can transmit harmful parasites like Tapeworms and Murine Typhus, as well as cause dermatitis and anemia. One flea can reproduce nearly 50 times a day, making a flea infestation a substantial threat to your pet’s wellbeing. Flea infestations often spread throughout your home — living in your carpet and furniture and making them tough to eradicate. Ticks are found lurking in shrubs and tall grass. They attach to your pet as they run past, biting them and feeding on their blood. Although nearly microscopic, the tick represents one of the most potent dangers to your pet’s health. A single tick bite can carry a host of potentially fatal diseases including Lyme Disease, Typhus, Rocky Mountain Spotted Fever, Ehrlichiosis and Anaplasmosis. Heartworm-carrying mosquitos represent a lethal danger to your pet. The mosquito’s bite transmits the heartworm larva to your animal, it then slowly develops and makes its toward the heart. Once there it multiples within your pet’s pulmonary artery, leading to constricted blood flow, heart disease and major organ failure. Regular application of anti-parasitic medication is a surefire way of keeping your pet free of nasty parasites. Consult with your South Broward Animal Hospital veterinarian to determine the best parasite control products for your pet. Schedule an appointment immediately if you suspect that your cat or dog may already be infected.